Gem Lake is an oft overlooked destination for hikers. 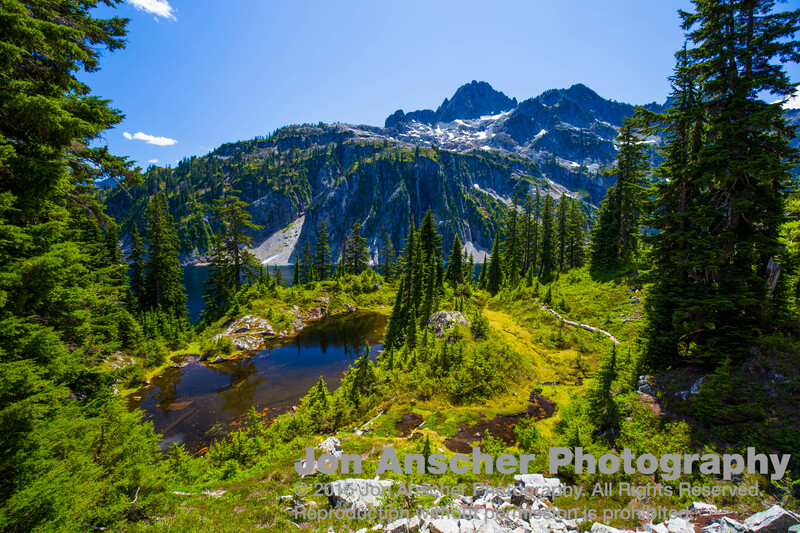 Snow Lake is a busy trail, which tends to dissuade serious hikers, and Gem Lake can be a long day for those less than serious. 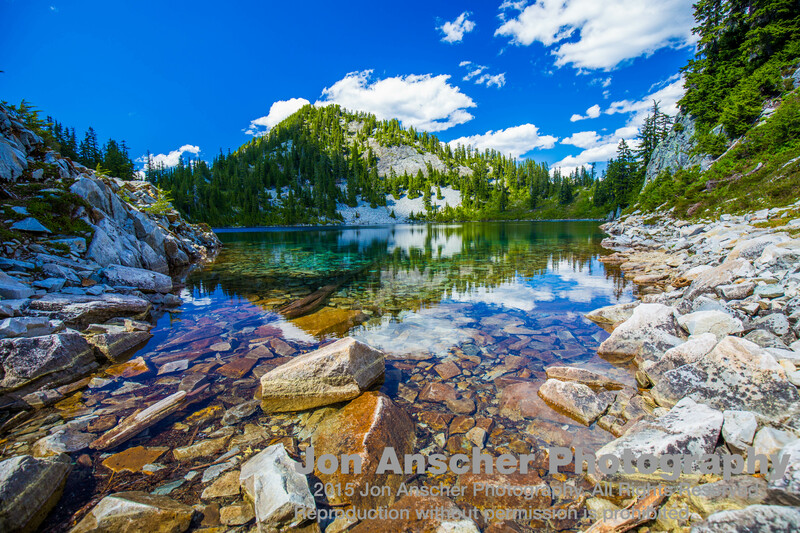 But, the escape from the crowds at Snow Lake, and the beauty of this subalpine pond make it a perfect destination. It is a mere hour drive from Seattle, making it ideal for a late start. Simply hop onto I-90 East and drive to the Alpental parking lot. From there, the hike is 10 miles round trip with about 2500 feet of elevation gain. With such a short drive, I often find myself returning here year after year when the mood strikes, but I don’t want to drive too far. I arrived at the trailhead and was hiking around 13:00. The trail begins with a fairly steep 200 foot climb, but then levels out to a gradual climb for the next 1.5 miles. The first mile is almost entirely in the trees, but then the vegetation begins to give way to talus slopes and clearings. Many a good views of the nearby peaks can be had from this part of the trail. At about 1.75 miles from the trailhead, the trail begins to switchback up the face of a steep valley wall. The trail also splits here, at the edge of the first major switchback, one trail heading up to Source Lake (which I’d return to later), and other heading to Snow and Gem. As you continue your climb, the trail remains largely exposed to the sun and heat, so be ready with sunscreen or good sun clothes. About 2.5 miles and 1800 feet of elevation gain from the trailhead, you will reach the Saddle and get your first glimpses of Snow Lake, deep and blue in the pocket below. 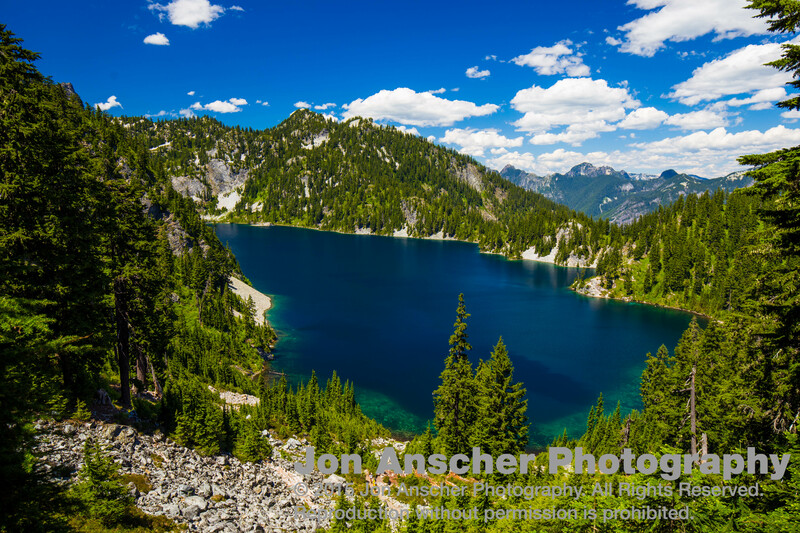 From there you have a 400 ft drop and another mile or so in to Snow Lake’s shore. And my objective, Gem Lake, was still a ways ahead. So, I did not dally, but headed on down. Close to the bottom, you will come across what has become a maze of trails, several of which cross one of the Snow Lake inlets at several points. I chose to walk by the remains of the old cabin on my way down to the lake. All that is left are parts of the stone wall a foot or two high, the base of a fire place, and the foundation. What a place for a cabin though! I scrambled down a path to the shore, where I meandered for a bit before settling into a small shaded nook to eat some lunch and enjoy the scenery. Although not as busy as it sometimes is, there were still a good two dozen other hikers sharing the view with me. Knowing there were even more beautiful spots along the lake, I continued along the path. From there, I had to hike back up to the main trail, and follow it as it meanders a mile or so around the lakeside. The trail climbs to bluffs above the lake, back down to a log crossing, and then begins the at times gradual, at times steep climb up to Gem Lake. Along the lake shore, perhaps my favorite spot is the log bridge with its wide view. 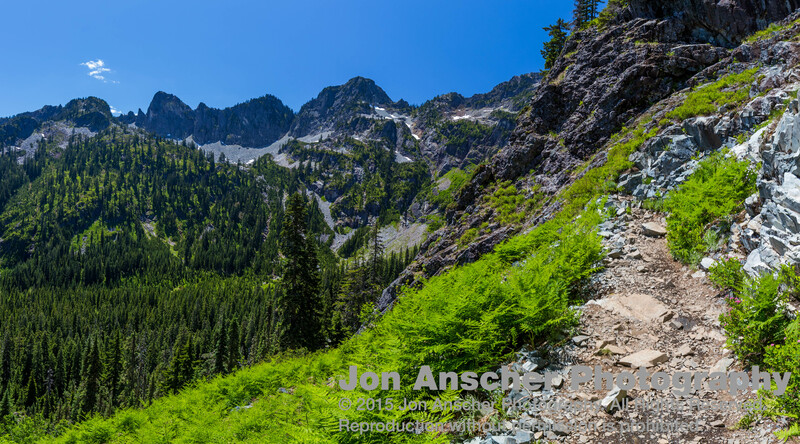 As the trail climbs from Snow, you find yourself exploring many facets of the subalpine meadows surrounding it. Small pots and ponds speckle the landscape up to Gem Lake. Around each corner is a new sight, including sweeping views of the mountains to the north and east, and broad views of Snow Lake below. 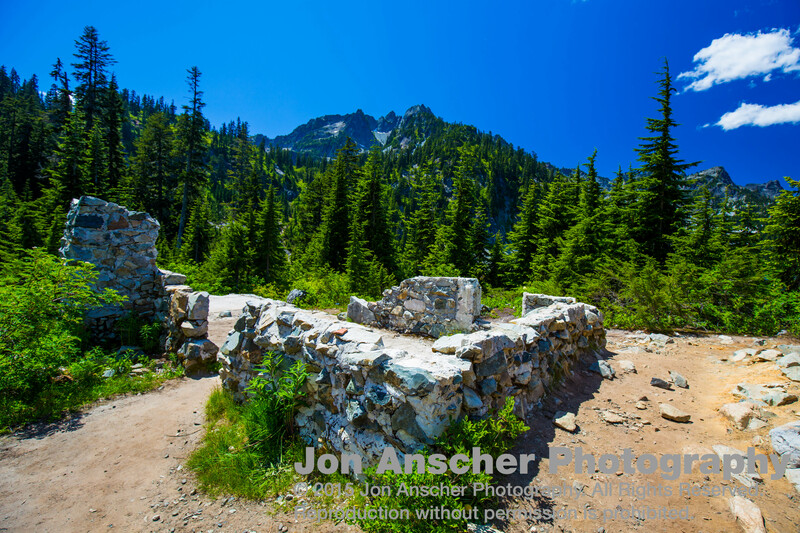 Around one of those turns is another, far less used, access trail up to Snow Lake from the Middle Fork Snoqualmie Valley. A little after this intersection, the trail begins to climb again in more earnest. 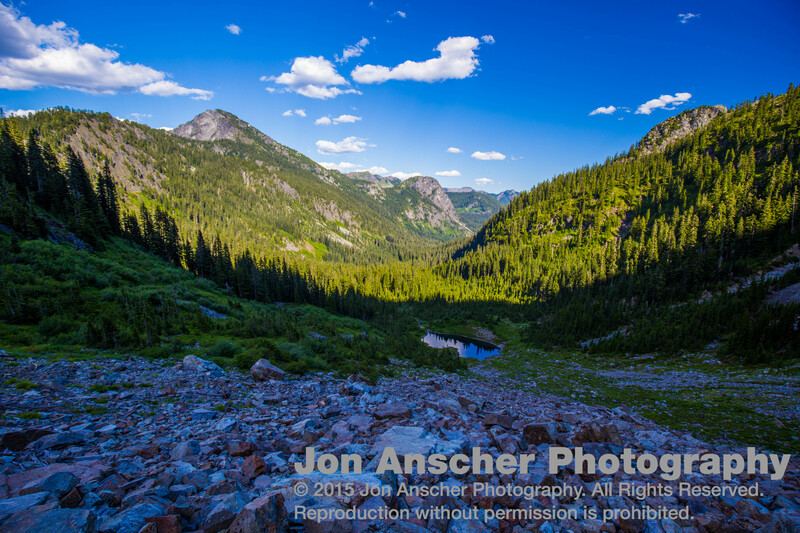 As you move away from Snow Lake, the subalpine meadows give way to steep slopes and talus slopes. And finally, after one last climb, 5 miles from where you started, you pull up to Gem Lake. The area around the lake offers several spots for potential overnight campers, and the trail leads on to Wildcat Lakes. I’ve hiked a little down that trail, but not all the way to Lower Wildcat. I’ve heard a small climbers trail leads from Lower to Upper Wildcat, and the pictures I’ve seen there are beautiful. It would make for a good long day hike, or a solid overnight. There is also a smaller less used trail that loops back around. 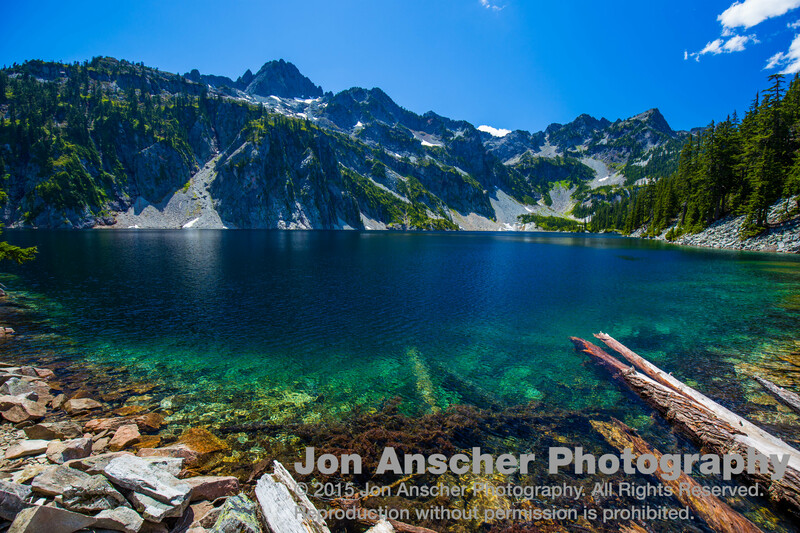 I have not traveled down it before, but given the landscape, I think it could only go back down to Snow Lake. Gem Lake was my turn around point. I had enough time to spend a short half hour exploring and taking shots here. On this particular day I found myself racing against the changing cloud cover to capture some good shots of the lake. By the time I’d gotten around the lake to take it, the cloud cover had already moved in and the light was less than ideal. So I continued rambling around, looking for more good shots, when the clouds parted and let the light in. I had to rush back and just captured the money shot before the clouds filled that hole again. After a bit of rambling and a short moment of meditation, I turned around and headed back down the trail. The return trip was largely the same in reverse, until I came back around to the Source Lake trailhead. Wanting to scout this out as a potential hike for when my parents came out, I ran the short way up this trail. I climbed a good way above Source Lake without seeing a clear path down. It looked like a scramble down a boulder field to access the lake. Fine for me, but probably not something my Floridian parents would be too interested in. Maybe worth the view, but without a good place to stop and enjoy the view, probably not.